For other uses, see Torc (disambiguation). The word comes from Latin torquis (or torques), from torqueo, "to twist", because of the twisted shape many of the rings have. Typically, neck-rings that open at the front when worn are called "torcs" and those that open at the back "collars". Smaller bracelets and armlets worn around the wrist or on the upper arm sometimes share very similar forms. Torcs were made from single or multiple intertwined metal rods, or "ropes" of twisted wire. 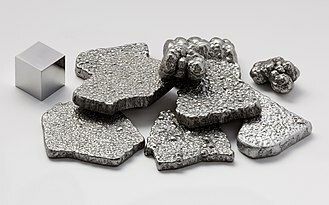 Most of those that have been found are made from gold or bronze, less often silver, iron or other metals (gold, bronze and silver survive better than other metals when buried for long periods). Elaborate examples, sometimes hollow, used a variety of techniques but complex decoration was usually begun by casting and then worked by further techniques. The Ipswich Hoard includes unfinished torcs that give clear evidence of the stages of work. Flat-ended terminals are called "buffers", and in types like the "fused-buffer" shape, where what resemble two terminals are actually a single piece, the element is called a "muff". There are several types of rigid gold and sometimes bronze necklaces and collars of the later European Bronze Age, from around 1200 BC, many of which are classed as "torcs". They are mostly twisted in various conformations, including the "twisted ribbon" type, where a thin strip of gold is twisted into a spiral. Other examples twist a bar with a square or X section, or just use round wire, with both types in the three 12th– or 11th-century BC specimens found at Tiers Cross, Pembrokeshire, Wales. The Milton Keynes Hoard contained two large examples of thicker rounded forms, as also used for bracelets. The terminals are not emphasized as in typical Iron Age torcs, though many can be closed by hooking the simple terminals together. Many of these "torcs" are too small to be worn round the neck of an adult, and were either worn as bracelets or armlets, or by children or statues. Archaeologists find dating many torcs difficult, with some believing torcs were retained for periods of centuries as heirlooms, and others believing there were two periods of production. 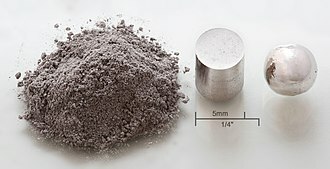 Differing ratios of silver in the gold of other objects—typically up to 15% in the Bronze Age but up to 20% in the Iron Age—can help decide the question. There are several flared gold torcs with a C-shaped section in the huge Mooghaun North Hoard of Late Bronze Age gold from 800 to 700 BC found in County Clare in Ireland. To the East, torcs appear in Scythian art from the Early Iron Age, and include "classicizing" decoration drawing on styles from the east. 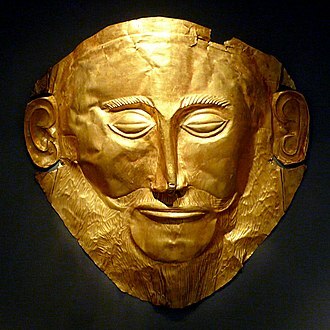 Torcs are also found in Thraco-Cimmerian art. 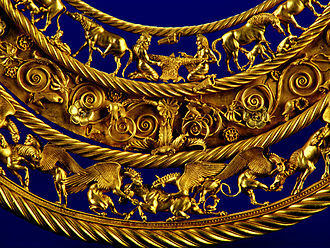 Torcs are found in the Tolstaya burial and the Karagodeuashk kurgan (Kuban area), both dating to the 4th century BC. A torc is part of the Pereshchepina hoard dating to the 7th century AD. Thin torcs, often with animal head terminals, are found in the art of the Persian Achaemenid Empire, with some other elements derived from Scythian art. 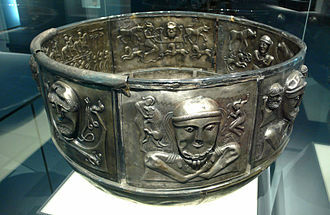 Depictions of the gods and goddesses of Celtic mythology sometimes show them wearing or carrying torcs, as in images of the god Cernunnos wearing one torc around his neck, with torcs hanging from his antlers or held in his hand, as on the Gundestrup cauldron. This may represent the deity as the source of power and riches, as the torc was a sign of nobility and high social status. 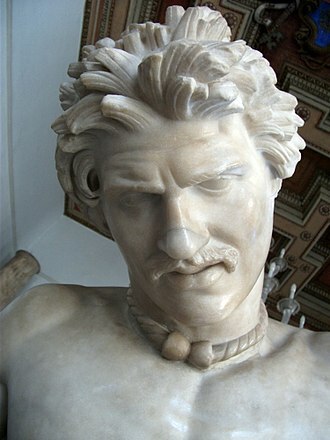 The famous Roman copy of the original Greek sculpture The Dying Gaul depicts a wounded Gaulish warrior naked except for a torc, which is how Polybius described the gaesatae, Celtic warriors from modern northern Italy or the Alps, fighting at the Battle of Telamon in 225 BC, although other Celts there were clothed. One of the earliest known depictions of a torc can be found on the Warrior of Hirschlanden (6th century BC), and a high proportion of the few Celtic statues of human figures, mostly male, show them wearing torcs. Other possible functions that have been proposed for torcs include use as rattles in rituals or otherwise, as some have stones or metal pieces inside them, and representations of figures thought to be deities carrying torcs in their hand may depict this. Some are too heavy to wear for long, and may have been made to place on cult statues. Very few of these remain but they may well have been in wood and not survived. Torcs were clearly valuable, and often found broken in pieces, so being a store of value may have been an important part of their use. It has been noted that the Iberian gold examples seem to be made at fixed weights that are multiples of the Phoenician shekel. With bracelets, torcs are "the most important category of Celtic gold", though armlets and anklets were also worn; in contrast finger-rings were less common among the early Celts. 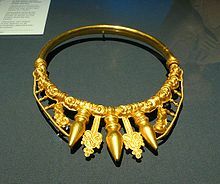 The earliest Celtic torcs are mostly found buried with women, for example, the gold torc from the La Tène period chariot burial of a princess, found in the Waldalgesheim chariot burial in Germany, and others found in female graves at Vix in France (illustrated) and Reinheim. 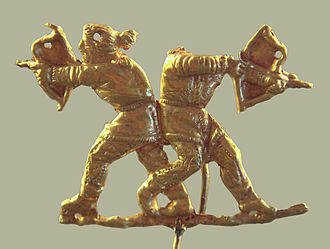 Another La Tène example was found as part of a hoard or ritual deposit buried near Erstfeld in Switzerland. It is thought by some authors that the torc was mostly an ornament for women until the late 3rd century BC, when it became an attribute of warriors. 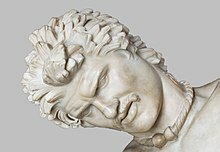 However, there is evidence for male wear in the early period; in a rich double burial of the Hallstatt period at Hochmichele, the man wears an iron torc and the female a necklace with beads. 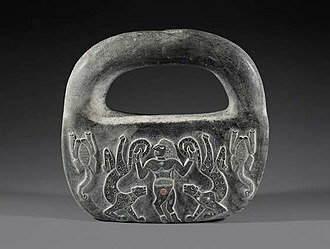 A heavy torc in silver over an iron core with bull's head terminals, weighing over 6 kilos, from Trichtingen, Germany, probably dates to the 2nd century BC (illustrated). Many finds of torcs, especially in groups and in association with other valuables but not associated with a burial, are clearly deliberate deposits whose function is unclear. They may have been ritual deposits or hidden for safekeeping in times of warfare. Some may represent the work-in-progress of a workshop. After the early period, torcs are especially prominent in the Celtic cultures reaching to a coast of the Atlantic, from modern Spain to Ireland, and on both sides of the English Channel. Some very elaborately worked torcs with relief decoration in a late form of La Tène style have been found in Britain and Ireland, dating from roughly the 3rd to 1st centuries BC. There may be a connection with an older tradition in the British Isles of elaborate gold neckwear in the form of gold lunulas, which seem centred on Ireland in the Bronze Age, and later flat or curved wide collars; gold twisted ribbon torcs are found from both periods, but also imported styles such as the fused-buffer. The most elaborate late Insular torcs are thick and often hollow, some with terminals forming a ring or loop. The most famous English example is the 1st-century BC multi-stranded electrum Snettisham Torc found in northwestern Norfolk in England (illustrated), while the single hollow torc in the Broighter Gold hoard, with relief decoration all round the hoop, is the finest example of this type from Ireland, also 1st century BC. The Stirling Hoard, a rare find in Scotland of four gold torcs, two of them twisted ribbons, dating from the 3rd to 1st century BC, was discovered in September 2009. Torc from Burela, Galicia, with double moulding scotiae terminals, and hoop decoration. At 1.812 kg (3.99 lb) the heaviest Iberian torc. The Roman Titus Manlius in 361 BC challenged a Gaul to single combat, killed him, and then took his torc. 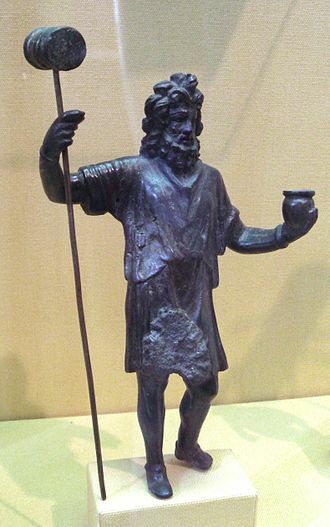 Because he always wore it, he received the nickname Torquatus (the one who wears a torc), and it was adopted by his family. 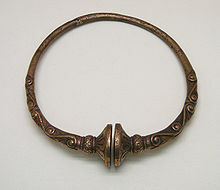 After this, Romans adopted the torc as a decoration for distinguished soldiers and elite units during Republican times. A few Roman torcs have been discovered. Pliny the Elder records that after a battle in 386 BC (long before his lifetime) the Romans recovered 183 torcs from the Celtic dead, and similar booty is mentioned by other authors. It is not clear whether the Gallo-Roman "Warrior of Vacheres", a sculpture of a soldier in Roman military dress, wears a torc as part of his Roman uniform or as a reflection of his Celtic background. Quintilian says that the Emperor Augustus was presented by Gauls with a gold torc weighing 100 Roman pounds (nearly 33 kilograms or 73 pounds), far too heavy to wear. A torc from the 1st century BC Winchester Hoard, is broadly in Celtic style but uses the Roman technique of laced gold wire, suggesting it may have been a "diplomatic gift" from a Roman to a British tribal king. A very late example of a torc used as ceremonial item in early Medieval Wales can be found in the writings of Gerald of Wales. The author wrote that there still existed a certain royal torc that had once been worn by Prince Cynog ap Brychan of Brycheiniog (fl. 492 AD) and was known as Saint Kynauc's Collar. 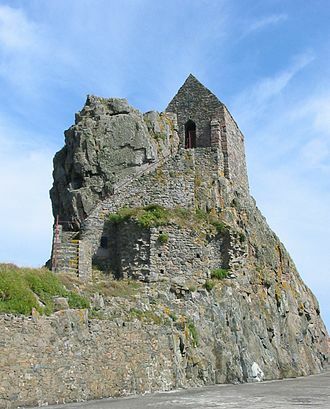 Gerald encountered and described this relic first-hand while travelling through Wales in 1188. Of it he says, "it is most like to gold in weight, nature, and colour; it is in four pieces wrought round, joined together artificially, and clefted as it were in the middle, with a dog's head, the teeth standing outward; it is esteemed by the inhabitants so powerful a relic, that no man dares swear falsely when it is laid before him." It is of course possible that this torc long pre-dated the reign of Prince Cynog and was a much earlier relic that had been recycled during the British Dark Ages to be used as a symbol of royal authority. It is now lost. There are mentions in medieval compilations of Irish mythology; for example in the Lebor Gabála Érenn (11th century) Elatha wore 5 golden torcs when meeting Eriu. 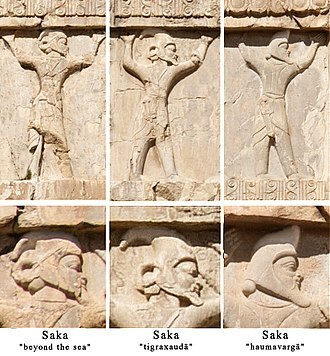 Most Achaemenid torcs are thin single round bars with matching animal heads as the terminals, facing each other at the front. Some Early Celtic forms break from the normal style of torc by lacking a break at the throat, and instead are heavily decorated at the continuous front, with animal elements and short rows of "balusters", rounded projections coming to a blunt point; these are seen both on the sculpted torc worn by the stone "Glauberg Warrior" and a gold torc (illustrated) found in the same oppidum. Later Celtic torcs nearly all return to having a break at the throat and strong emphasis on the two terminals. The Vix torc has two very finely made winged horses standing on fancy platforms projecting sideways just before the terminals, which are flattened balls under lions' feet. 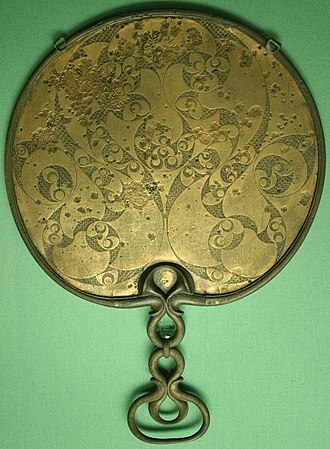 Like other elite Celtic pieces in the "orientalizing" style, the decoration shows Greek influence but not a classical style, and the piece may have been made by Greeks in the Celtic taste, or a "Graeco-Etruscan workshop", or by Celts with foreign training. Spiral ribbon torcs, usually with minimal terminals, continue a Bronze Age type and are found in the Stirling Hoard from Scotland, and elsewhere: "Although over 110 identifiable British [includes Ireland] ribbon torcs are known, the dating of these simple, flexible ornaments is elusive", perhaps indicating "a long-lived preference for ribbon torcs, which continued for over 1,000 years". The terminals were often slightly flared plain round cylinders which were folded back to hook round each other to fasten the torc at the throat. Other Celtic torcs may use various ways of forming the hoop: plain or patterned round bars, two or more bars twisted together, thin round rods (or thick wire) wound round a core, or woven gold wire. A rarer type twists a single bar with an X profile. Except in British looped terminals, the terminals of Iron Age torcs are usually formed separately. 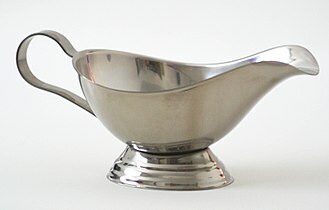 The "buffer" form of terminal was the most popular in finds from modern France and Germany, with some "fused buffer" types opening at the rear or sides. In both buffer types and those with projecting fringes of ornament, decoration in low relief often continues back round the hoop as far as the midpoint of the side view. In Iberian torcs thin gold bars are often wound round a core of base metal, with the rear section a single round section with a decorated surface. 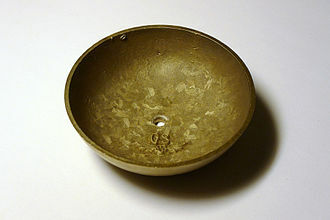 The c. 150 torcs found in the lands of the Iberian Celts of Galicia favoured terminals ending in balls coming to a point or small buffer ("pears"), or a shape with a double moulding called scotiae. The pointed ball is also found in northern Italy, where the hoops often end by being turned back upon themselves so that the terminals face out to the sides, perhaps enabling closure by hooking round. Both of these mostly used plain round bars or thin rods wound round a core. In the terminals of British torcs loops or rings are common, and the main hoop may be two or more round bars twisted together, or several strands each made up of twisted wire. Decoration of the terminals in the finest examples is complex but all abstract. In these two types the hoop itself normally has no extra decoration, though the large torc in the Irish Broighter Gold hoard is decorated all round the hoop, the only Irish example decorated in this way. Gold Celtic torc found in Vix, France, 480 BC; see text. Bell shaped torc terminal from A Guarda, Galicia. Museo do Castro de St. Tegra. The Gallo-Roman "Warrior of Vacheres"
Wikimedia Commons has media related to Torcs. Kalabubu, a torc of Nias people made of coconut shell. ^ The Illyrians by J. J. Wilkes, 1992, ISBN 0-631-19807-5, page 223, "Illyrian chiefs wore heavy bronze torques"
^ "Treasure Annual Report 2000" (PDF). Department for Culture, Media and Sport. 2001. pp. 13–15, 133. Archived from the original (PDF) on 2012-03-01. Retrieved 2010-07-26. ^ Wallace, 99; Treasures, no. 8. Nos. 4 and 6 are Bronze Age gold spiral ribbon torcs, and No. 10 is an elaborate flat collar. Taylor has full coverage of British gold Bronze age material. 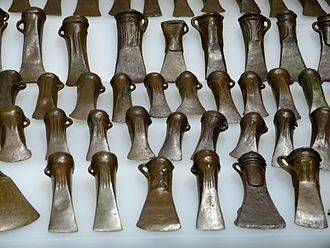 ^ Key examples of all Irish types are in both Wallace and Treasures; see previous reference for older types, the Iron Age ones are: Treasures nos. 14, 15, 21 and Wallace chapter 4, nos. 3, 4 and 10. ^ Wade, Mike (2009-11-04). "1m golden hoard rewrites history of ancient Scotland". The Times. London. Retrieved 2010-05-25. ^ Alberge, Dalya (8 September 2003). "Golden hoard of Winchester gives up its secret". The Times. Retrieved 2010-08-02. ^ "Treasure Annual Report 2000" (PDF). Department for Culture, Media and Sport. 2001. pp. 16–18, 133. Archived from the original (PDF) on 2012-03-01. Retrieved 2010-08-02. ^ Lady Gregory (2004) . "The Reign of Bres". 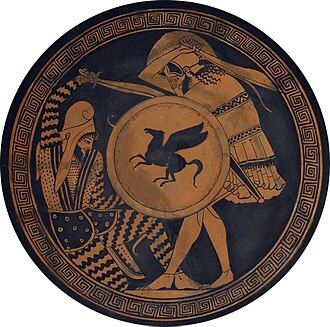 Gods and Fighting Men. Project Gutenberg. ^ González-Ruibal covers these in detail in the section "Torcs" and the "catalogue" following. 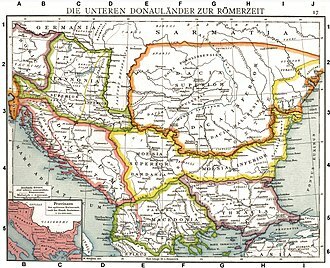 The ancient territory of the Gallaeci extended further east along the coast than the modern province, and the linguistic make-up of the region remains controversial. Prieto Molina, Susana (1996). "Los torques castreños del noroeste de la península ibérica". Complutum. 7: 195–223. The mountains were formed over tens of millions of years as the African and Eurasian tectonic plates collided. Extreme shortening caused by the event resulted in marine sedimentary rocks rising by thrusting and folding into high mountain peaks such as Mont Blanc, Mont Blanc spans the French–Italian border, and at 4,810 m is the highest mountain in the Alps. The Alpine region area contains about a hundred peaks higher than 4000 metres, the altitude and size of the range affects the climate in Europe, in the mountains precipitation levels vary greatly and climatic conditions consist of distinct zones. Wildlife such as live in the higher peaks to elevations of 3,400 m. Evidence of human habitation in the Alps goes back to the Palaeolithic era, a mummified man, determined to be 5,000 years old, was discovered on a glacier at the Austrian–Italian border in 1991. 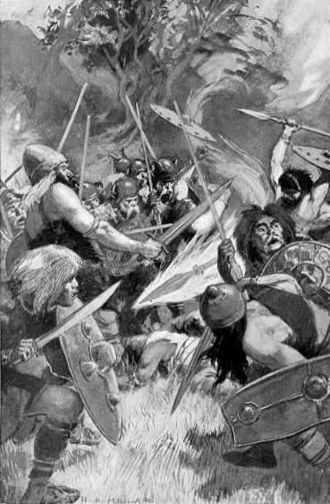 By the 6th century BC, the Celtic La Tène culture was well established, Hannibal famously crossed the Alps with a herd of elephants, and the Romans had settlements in the region. In 1800 Napoleon crossed one of the passes with an army of 40,000. The 18th and 19th centuries saw an influx of naturalists, writers, in World War II, Adolf Hitler kept a base of operation in the Bavarian Alps throughout the war. The Alpine region has a cultural identity. The Winter Olympic Games have been hosted in the Swiss, French, at present, the region is home to 14 million people and has 120 million annual visitors. The English word Alps derives from the Latin Alpes, maurus Servius Honoratus, an ancient commentator of Virgil, says in his commentary that all high mountains are called Alpes by Celts. The term may be common to Italo-Celtic, because the Celtic languages have terms for high mountains derived from alp and this may be consistent with the theory that in Greek Alpes is a name of non-Indo-European origin. According to the Old English Dictionary, the Latin Alpes might possibly derive from a pre-Indo-European word *alb hill, Albania, a name not native to the region known as the country of Albania, has been used as a name for a number of mountainous areas across Europe. The Stirling torcs make up a hoard of four gold Iron Age torcs, a type of necklace, all of which date to between 300 and 100 BC and which were buried deliberately at some point in antiquity. They were found by a metal detectorist in a field near Blair Drummond, the hoard has been described as the most significant discovery of Iron Age metalwork in Scotland and is said to be of international significance. The torcs were valued at £462,000, and after an appeal were acquired for the National Museums of Scotland in March 2011. 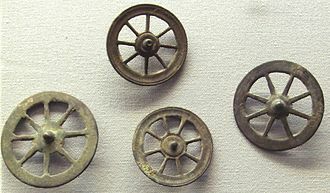 The finder was a metal detectorist, David Booth, who found the torcs on his first treasure-hunting outing, using a basic model metal detector. Having identified an area he considered to be of good potential, I parked up and got the metal detector out. There was an area of ground behind the car, and I thought, I’ll just scan this first. Literally about seven steps behind where I had parked, I found them, Booth took the torcs home and washed them in water. 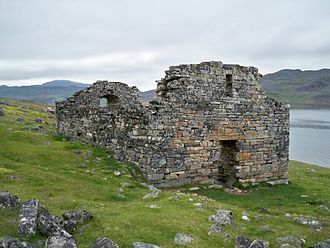 Dr Fraser Hunter said he almost fell off seat when he first saw photographs of the discovery the next morning, the subsequent archaeological excavation at the site exposed the remains of a wooden roundhouse but found no more artefacts. All four torcs were buried together, some 15–20 centimetres below the surface, subsequent archaeological investigations determined that the torcs had originally been buried within a roundhouse, a prehistoric circular building. All four torcs date to between 300 and 100 BC, they are highly and unexpectedly varied in form and style which greatly adds to the significance of the find, two twisted ribbon torcs, in perfect condition, are elegant and relatively simple in design. 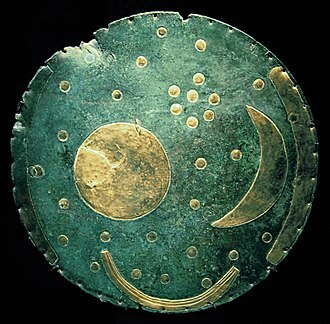 One has plain hooked terminals while the other has more decorative disc terminals, the third torc is broken, with only half of the original artefact surviving in two fragments. It is a tubular annular torc, which would have had a hinge and it is of ornate design compared to the ribbon torcs, and experts have identified it as a type originating from the Toulouse area in southern France. 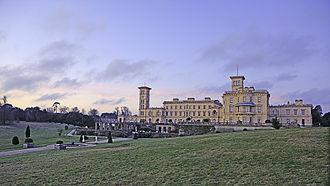 It is the first of its kind to have found in Britain. The fourth torc is a looped terminal torc, complete and in good condition and it is made from eight gold wires twisted together. Cernunnos is the conventional name given in Celtic studies to depictions of the horned god of Celtic polytheism. 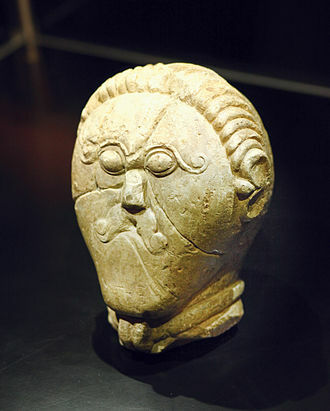 Cernunnos was a Celtic god of fertility, animals, the name itself is only attested once, on the 1st-century Pillar of the Boatmen, but he appears all over Gaul, and among the Celtiberians. Not much is known about the god from literary sources, and details about his name, speculative interpretations identify him as a god of nature, life or fertility. The theonym ernunnos appears on the Pillar of the Boatmen, a Gallo-Roman monument dating to the early 1st century CE, both antlers have torcs hanging from them. The name has been compared to a divine epithet Carnonos in a Celtic inscription written in Greek characters at Montagnac, a Gallo-Latin adjective carnuātus, horned, is found. The Proto-Celtic form of the theonym is reconstructed as either *Cerno-on-os or *Carno-on-os, the augmentative -on- is characteristic of theonyms, as in Maponos, Epona and Sirona. 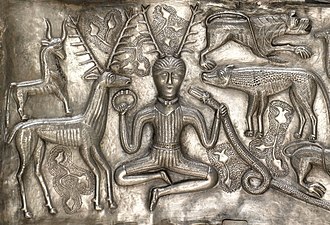 Maier states that the etymology of Cernunnos is unknown, as the Celtic word for horn has an a, Gaulish karnon horn is cognate with Latin cornu and Germanic *hurnaz, English horn, ultimately from Proto-Indo-European *k̑r̥no-. 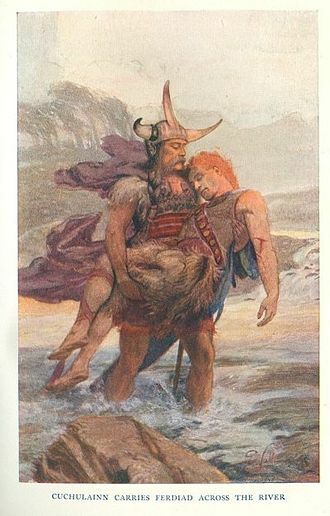 The etymon karn- horn appears in both Gaulish and Galatian branches of Continental Celtic, the root appears in the names of Celtic polities, most prominent among them the Carnutes, meaning something like the Horned Ones, and in several personal names found in inscriptions. The name Cernunnos occurs only on the Pillar of the Boatmen, the distinctive stone pillar is an important monument of Gallo-Roman religion. Its low reliefs depict and label by name several Roman deities such as Jupiter and Castor and Pollux, along with Gallic deities such as Esus and this inscription read Deo Ceruninco, to the God Cerunincos, assumed to be the same deity. The Gaulish inscription from Montagnac reads αλλετνος καρνονου αλσοεας, with the last word possibly a place based on Alisia. 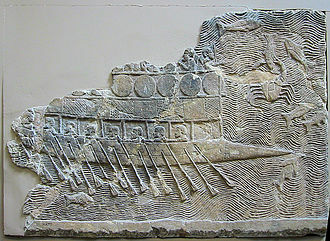 The god labelled ernunnos on the Pillar of the Boatmen is depicted with stags antlers in their stage of annual growth. Both antlers have torcs hanging from them, the lower part of the relief is lost, but the dimensions suggest that the god was sitting cross-legged, providing a direct parallel to the antlered figure on the Gundestrup cauldron. A set of four torcs discovered in Stirlingshire, Scotland in 2009. Schematic plan of Glauberg oppidum, burial mounds and ditch systems (banks/walls: brown, ditches: yellow). 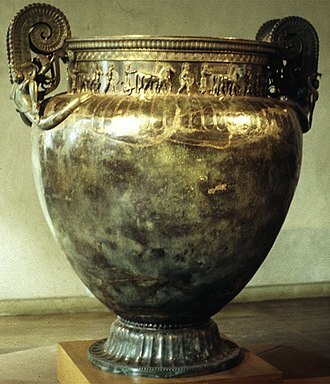 The Vix Krater, an imported Greek wine-mixing vessel found in the famous grave of the "Lady of Vix"
Vix palace, late 6th century B.C. Reconstructed Celtic Heuneburg in 600 B.C. Heuneburg: Reconstructed Celtic houses. The reconstructed mudbrick wall is visible in the background. A schematic plan of the citadel, surrounded by the 600 BC mudbrick wall. Internal structures (as far as known) as in circa 550 BC. Gold lunula from Schulenburg, Germany, Provincial, linear group.